I wanted to share briefly about a problem I solved with my mailing list. I have an email sign up form on my music website that has an optional ZIP Code field. My goal is to use this data to make smarter decisions when planning for marketing and touring. The problem I’ve run into is that I haven’t found a good way to visualizing this data. To the best of my understanding, email marketing services like MailChimp and others don’t have any way of doing this. Instead, I built a small web app that makes this easy. 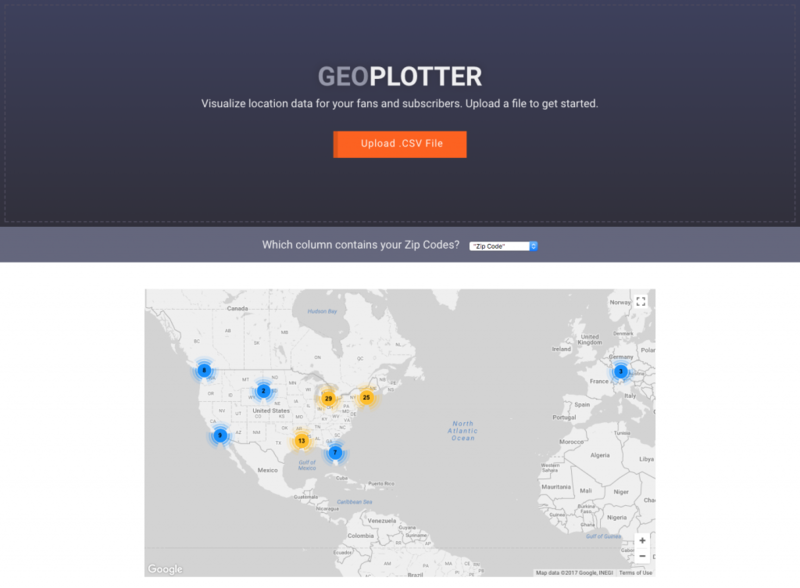 It accepts a CSV file and outputs the ZIP codes, or any other address data, on a Google map with markers for each subscriber. I have it configured to create cluster markers for individual markers that are close together and display the number of the total markers in that region. It’s a very straightforward tool that does one thing, but it’s been working great for me so far! I think this tool would be helpful for other folks collecting similar data with their subscribers, so I thought I’d let you know about it. I would be interested to know how this works for larger lists (1,000+) and if there are other features that might be useful. The code is available on GitHub and you can use the web app by visiting the link below.